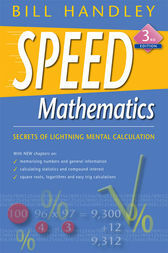 This new, revised edition of the bestselling Speed Mathematics features new chapters on memorising numbers and general information, calculating statistics and compound interest, square roots, logarithms and easy trig calculations. Written so anyone can understand, this book teaches simple strategies that will enable readers to make lightning-quick calculations. People who excel at mathematics use better strategies than the rest of us; they are not necessarily more intelligent. With Speed Mathematics you'll discover methods to make maths easy and fun. This book is perfect for students, parents, teachers and anyone who enjoys working with figures and even those who are terrified of numbers! Based in Melbourne, Bill Handly is recognized as an authority of mathematics and study methods in Australia and overseas. His methods of teaching maths, learning and thinking strategies have achieved astonishing results in schools worldwide.